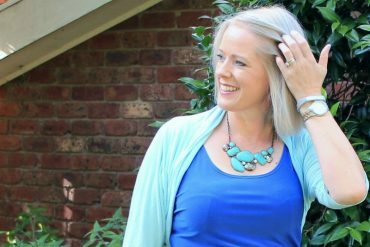 Warning – this post includes photos of my feet and scars. 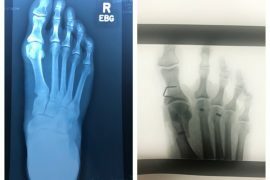 Now that I have metal screws in my foot, would I automatically trigger the security sensors at airports? Well, I discovered that the answer is no, as I took a trip to Brisbane on the weekend to attend the Australian Psych0logical Type conference and spend time with the lovely Jill Chivers making some new videos for your delectation. If I’d had my time again (and I checked with my surgeon before I took the trip if it was advisable or not), I probably wouldn’t have booked a plane trip so close to surgery. Sitting with my foot up at waist level or higher is fine. But sitting with it down (as required on an aeroplane) became pretty torturous during that 2.5 hour trip, even wearing the compression stocking that I was given for my operation. 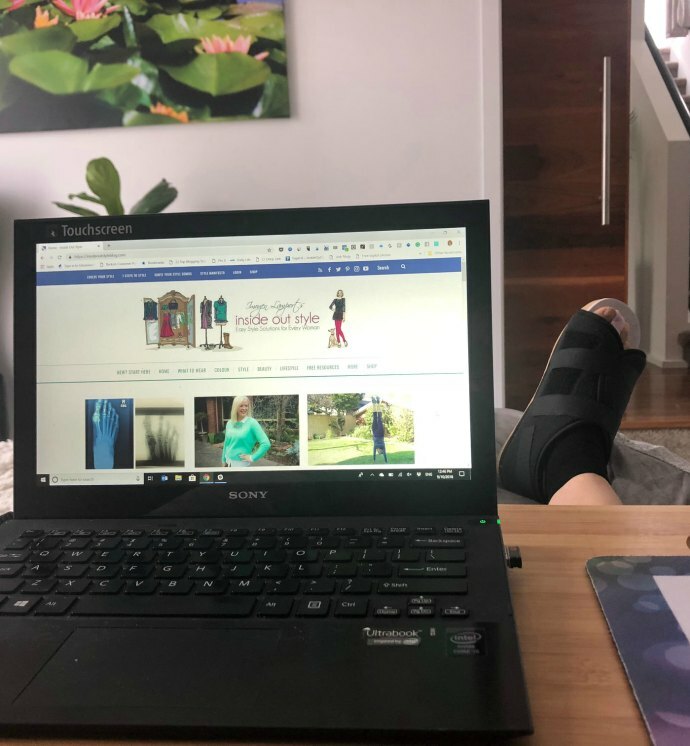 Fortunately, as I was mostly attending a conference, I could spend the majority of my time sitting with my foot up which eases the swelling and pain considerably. Also moving my foot and ankle helps to minimise the swelling and pain and keep the blood circulating. Speaking of pain, I wrote too soon that I could give up the hard drugs in my last post. I found that daytime paracetamol was enough to dull the pain, as there were enough other things to distract me from the bone pain. But at night when trying to sleep, I had to keep taking an opioid to allow for decent rest and sleep (so important for healing). I stopped taking them overnight at my 2 week anniversary post-operatively, as the bone pain (a weird ache deep inside my foot) all but disappeared at that stage. So now I only take a paracetamol when necessary and am trying out the Panadol Osteo option as it’s longer lasting (8 hours). This week I’m easing back into doing some work, but still resting lots. My plan is to work half a day at a time, so not to overdo it and put my recovery back. Because I need to keep my leg up high, I can’t sit at my desk for more than 30 minutes at a time without pain (and the pain is all about swelling at the moment – it just makes my foot throb), so I’m propped up on my bed (I got myself this grey bed computer desk/tray) so that I can do some work in relative comfort. And I can tell it’s going to come in handy even after this recovery period is over. 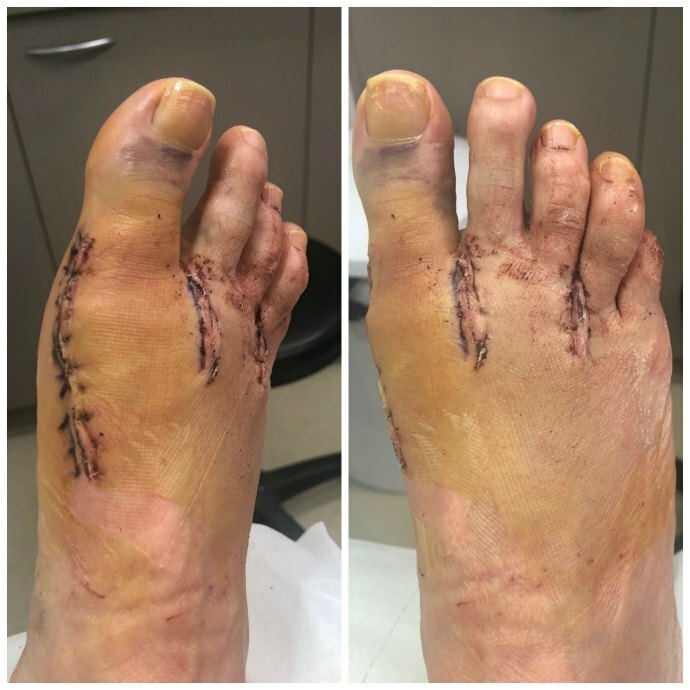 I was so happy to see my surgeon at the two-week mark and have the bandage removed, it was stiff and hard with dried blood (sorry to get graphic on you) that pressed against the wounds, so there was an immediate sense of relief upon removal. 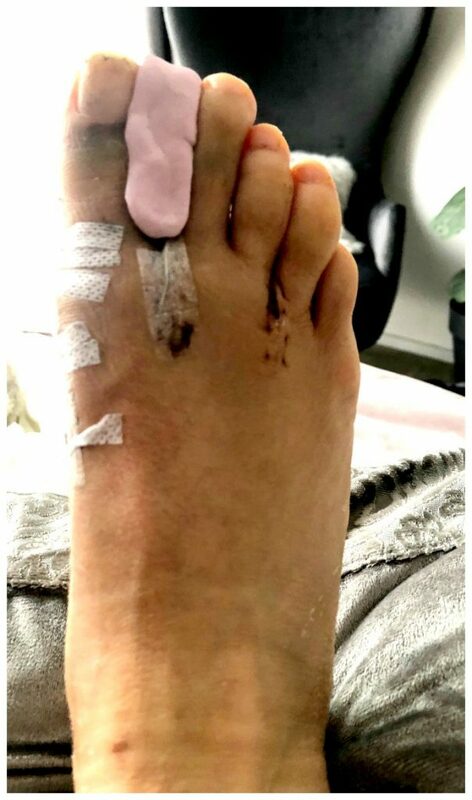 My stitches were also removed and a dressing placed over the top for a few days (still showering with my foot in a cast protector sleeve as I wasn’t allowed to get my foot wet). Now that the dressings are off I can shower regularly (though still recommended to not soak my foot until the wounds have completely healed up). 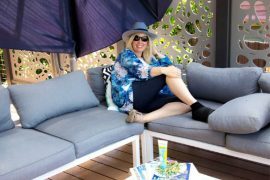 Normal bunion surgery scar is just the one on the side of the foot at the big toe, I have two extra scars as my 2nd and third toes were also lifted as I’d been getting blisters on the ball of my foot between those toes. This is not part of a normal bunion operation. But, be warned, after your foot has been bandaged up for weeks, well, there is a lot of dead skin that hasn’t been shed so now that’s gradually peeling away, and I do have a bit of a rub with a face cloth to try and remove as much as possible while in the shower. My surgeon has recommended using lots of moisturiser or bio oil on the scars to promote healing and reduce scar tissue. I’ve had to keep some tape on them as they haven’t quite healed up enough yet. 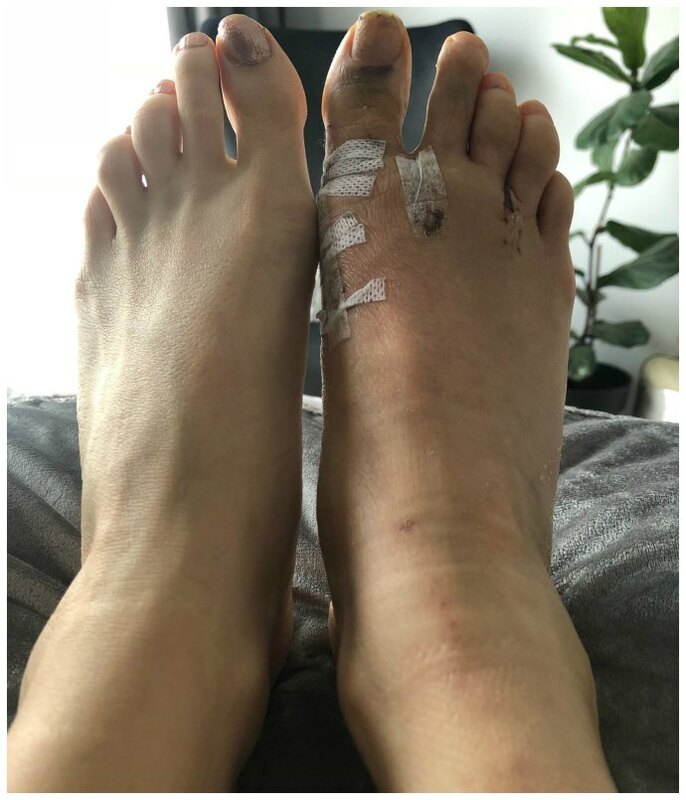 My foot is pretty bruised and sore – I have a massive bruise on the arch of my foot and also on my big toe as well as smaller bruises around the incision sites. Because I had 4 toes operated on these all have felt quite numb, but feeling in my toes is starting to come back this week as the swelling is reducing. My surgeon also made a toe separator, moulded to my foot, to keep my big and 2nd toes apart to promote healing in the right direction too. The toe separator made from a soft rubbery compound moulded to fit between my toes and keep my big toe straighter as it heals. I still don’t like the feeling of things pressing on my big toe, so I cut the top off a sock to wear during the day, and at night I’m still sleeping with my foot on a pillow or two but uncovered by any sheets or blankets. I’m also starting with my physical therapy exercises to ensure that my joints get remobilised (as they are stiff), bending my toes upwards gently at the big toe joint (where the toe meets my foot) and holding for a few seconds at a time is that stage that I’m currently at. 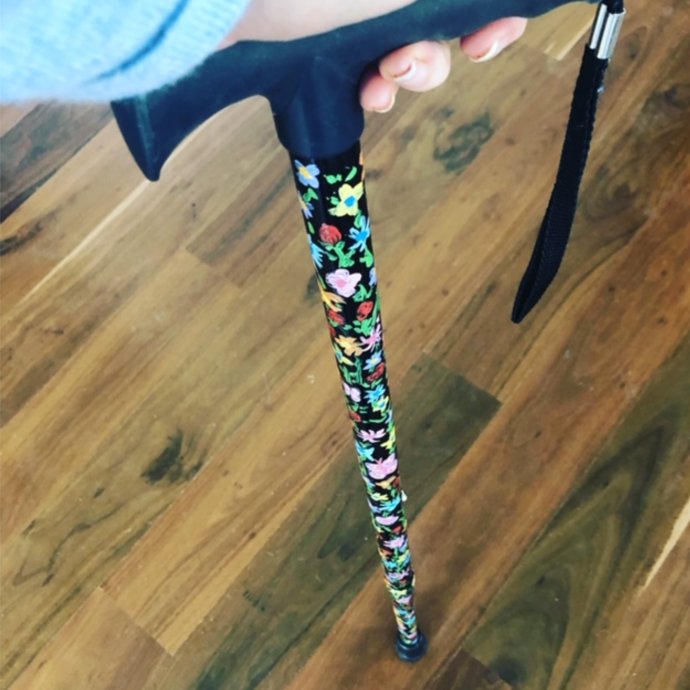 I stopped needing crutches about 10 days after surgery and have now got a cane (found it at Savers thrift store for $5 and decided to decorate it). 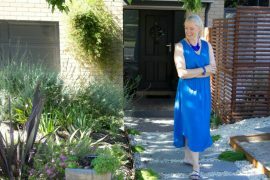 I can easily walk without the cane, but have been advised by my doctor when out and about to take it – more for safety and tripping, and using it for support if I’m tired. 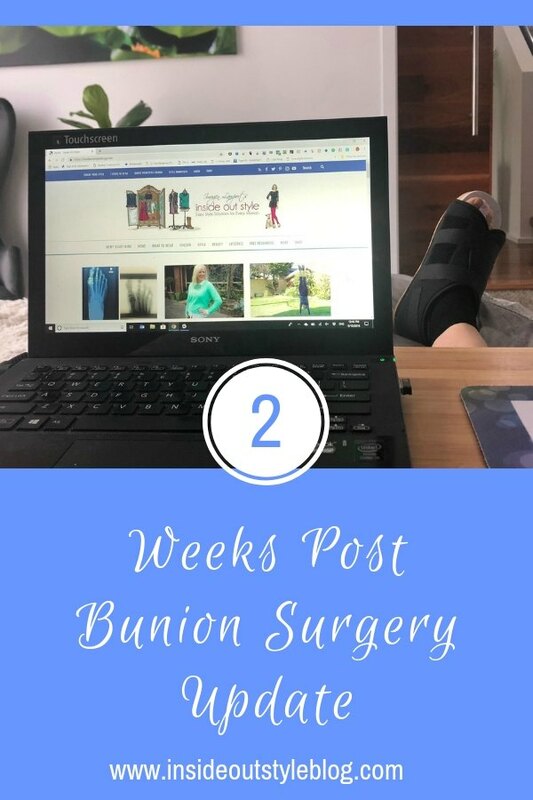 2 weeks post bunion surgery – right foot is still quite swollen. You can see that my right foot is still quite swollen compared to my left, but it has gone down considerably in the past two weeks. So there you have it. Thanks for all your Netflix recommendations (have watched a few, read some books, and rested as much as possible). And I’m really looking forward to the swelling going down to a point where I can sit up without having to have my foot up. I have to keep wearing the post-operative shoe when walking for 4 more weeks and am not allowed to drive until I reach 6 weeks post-operative too (that is the biggest pain!). 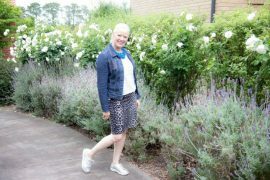 I’ve found with the shoe that to keep my hips well balanced I have to wear a shoe on my left foot – something flat but with a sole that is around 1cm thick. How Much Jewellery at Once? Thanks for the report, Imogen. That is one straighter foot, but takes quite a lot of recovery. All best for smooth healing and regaining full range of movement. Bio oil is great for minimising scars. Re Netflix- one recommendation would be Secret City political thriller short series set in Canberra. I wish you a full and rapid recovery ! Not fun but I’ve been assured it will be worthwhile – I do hope so! Thanks for the update! I hope your healing continues to go smoothly. Your foot is looking very shapely for just two weeks out! The big toe separator is a great idea. And you get some relief and air on your foot. I had to wear a surgical boot in bed and out except for bathing for six weeks! Netflix? Wired in the Blood Series starring Robson Green. I figure if I’m lying in bed with my foot up and nothing is touching it I can have the boot off for a bit! Thanks for the report Imogen. Keep taking it easy. Wow! Your right foot looks fabulous considering the traumatic surgery only a few weeks ago. Here’s to Happy Health & Healing 🤗. Did you polish the left toenails ☺️? I’ve found polished “piggies”, even just one foot, helps boost my mood; improves healing of body & Spirit. Love your painted walking stick with the cheery flowers. That’s a sweet idea. 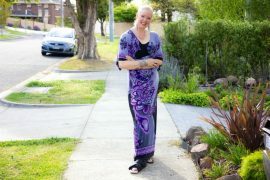 I use Nordic-Walking poles for stability & balance. TeeHee, I put ribbons & bells on them for Christmas/Winter and ribbons & flowers for Spring/Summer/Fall. Figure why not have fun & be unique! Yes my foot is looking better – though it’s still quite swollen compared to my left, not that you can see it in the photos as it’s the ball of my foot that’s very swollen. Yes left foot has polish, not right foot at present (they made me take off polish for the operation). But I do love a polished toe! Ouch Imogen ! I hope you are healed by now. You seem to have skin that heals well. This looks and sounds so painful. Thanks- it’s getting better slowly! Both feet! Your brave to do them at the same time! Stay off your feet as much as possible -they say it speeds up healing. Surgery and have two kids. Dreading the downtime as I’m so active. Could you do anything? Cook? Clean? I’m not good sitting still! First few days not much – but after that I could stand for longer and do some cooking. You really can’t do much and you’re supposed to have for the first 3 weeks your foot above your nose for 55 minutes of every hour!